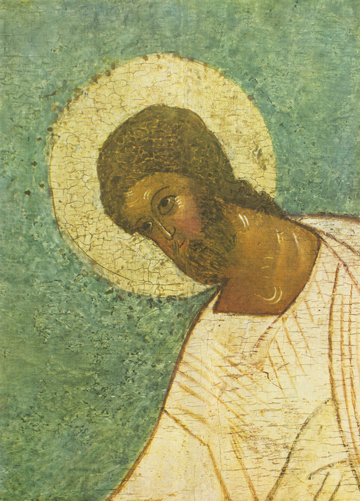 Christ is shown here in a close-up detail from a 16th c. Russian icon. His robe is brilliant white with the brightness and glory of the Holy Resurrection which has just broken over the horizon of the world as He pulls Adam and Eve out of the nether world and into Heaven, as can be seen in the complete icon F53. This detail shows the intent mercy and love of God for us, for the Lord’s Death and Resurrection are not just the cosmic fix of humanity’s existential problems, but the very conscious culmination of the saving work of Christ–to deify and glorify the innate image and likeness of Mankind into the fullness of the Heavenly Man that he was created for, now remade as he was always intended to be. We can now in truth become far more than Adam’s condition before the Fall, for the Second Adam, Christ our God, has come to refashion the potential godliness of Adam into actual godliness. St. Athanasios the Great says in reference to the purpose of the Incarnation that “God became man so that man could become God”, not by nature, but by adoption. Let us live up to our inheritance with intent Faith and Love, and so be transfigured like Him.